If you try only one pizza in NYC it must be from Joe’s Pizza. This Greenwich Village institution has been serving the classic New York slice for nearly 40 years. Pizzas are hot and fresh. Toppings are simple, like classic cheese or pepperoni. The crust is thin and crispy. Seriously you can’t go wrong. As the pizzeria is small, grab a slice ($2.75) and head over to the small village square across the way. Don’t be fooled by other pizzeria’s with the same name – there seems to be a lot. 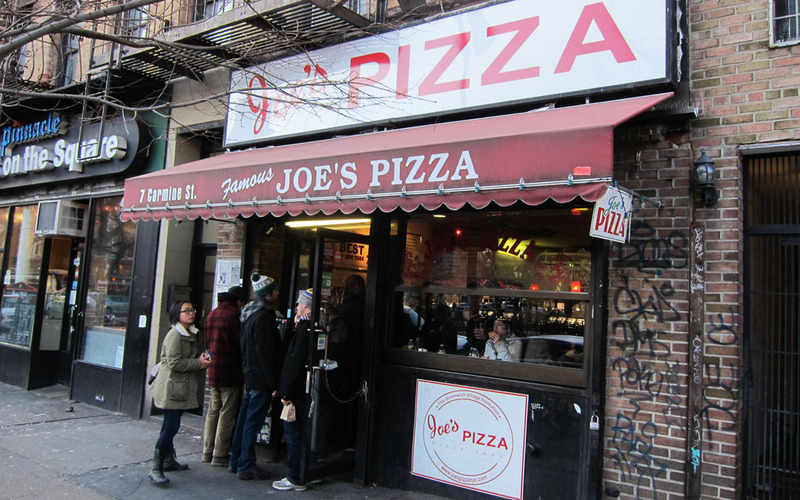 Joe’s Pizza has only two branches in Manhattan, the Carmine Street branch (featured here), and the one at 150 East 14th Street, Union Square.